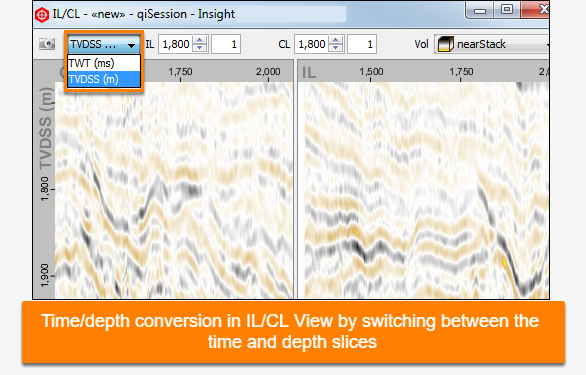 Real-time conversion of time/depth slice is possible in Insight. As a prerequisite for this conversion, you need to have a velocity volume loaded (see Importing a Volume). The following sections will guide you to select and configure the velocity volume to be used for time/depth conversion in the project. With all these being set up, Insight will be able to convert your data between the time and depth slices on-the-fly in all the different views. 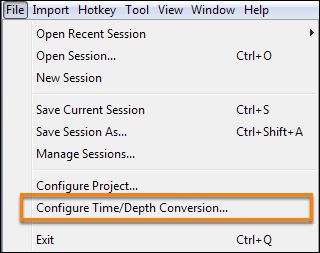 In the Configure Time/Depth Conversion window, select the velocity volume to be used in the time/depth conversion at Velocity Volume. Both 2D and 3D velocity volumes can be used for time/depth conversion (see Importing a Volume). At Velocity Type, select the type of the velocity volume to be used for conversion between time and depth. At Velocity Units, select the velocity volume unit in m/s or ft/s for the velocity volume type that you have defined. This applies to interval, RMS and average velocities. For Time/Depth velocity, you can select m or ft. This feature allows you to override the unit of velocity data, which by default is set to metric values. Tip: For stacking velocities, you should select Velocity (RMS) as the class for the velocity volume. In this instance, the velocity volume type should be selected as RMS Velocity.